The genetic diversity of Larix × lubarskii Sukaczev and its genetic relationships to other larches from the south of Primorsky krai and Far Eastern and Siberian Larix species were for the first time studied according to the analysis of the UBC460 mitochondrial origin fragment length polymorphism and nucleotide sequences of the 5'-flanking region of the atpA gene and nad4(3c–4r) region in mitochondrial DNA. Two length variants of the UBC460 fragment were detected in the L. × lubarskii population (with a predominance of the short one). This taxon is characterized by an average haplotype (0.582) and low nucleotide (0.0003) diversity. 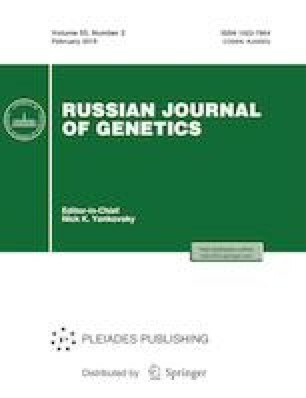 The comparative analysis of nucleotide polymorphism of two mtDNA regions in larches from the south of Primorsky krai revealed three mitotypes in L. × lubarskii; only one of them was common with L. olgensis A. Henry (locus classicus). The network of mitotype genealogical relationships indicates a common origin of L. × lubarskii and L. olgensis and their relatively recent divergence, as well as a closer relationship to L. sibirica Ledeb. than to L. gmelinii (Rupr.) Rupr. We are grateful to V.Yu. Barkalov for the provided plant material, K.V. Kiselev for the assistance in the development of primers for PCR product amplification of the fragment of the 5'-flanking region of the mitochondrial atpA gene, and D.M. Atopkin for the assistance in the sample preparation for sequencing. This work was supported by the Presidium of the Russian Academy of Sciences (project nos. 15-I-6-030 and 15-I-6-080).